When we have big barbecue parties here at the house, table space is always an issue. We have a small outdoor table, a little camp table, and then the grills have side spaces to work. But, all the spaces are small. It's not like you can put a full spread out on any of those. Our workaround has been to borrow a table from the church and then return it (of course). You'll see a church table at my son's graduation luau above. Now, that's a good sturdy table and something I have been needing. The issue has been space though. Like many folks, I do not live in a mansion. Finding space for a 6 foot table is a problem. Fortunately I won a contest at Solutions. This was back when Mug Root Beer gave me some prizes for readers for Father's Day. I was googling up "contest" and "giveaway" and looking for my Mug contest. Forgive me. I just can't help myself. I get excited about my blog and was excited to have the contest and prizes for folks who stop by Barbecue Master. It was while googling that I saw that Solutions had a Father's Day contest too. Hum. I thought, "Well, I'm having fun with the contest on my bbq blog. I'm sure Solutions will enjoy more stories." I'm generally not lucky at all. But, I thought I'd enter for the fun of it and to support another site hosting an online reader contest. I had not been familiar with Solutions but had looked around when I entered. I knew they had some cool stuff (including grill accessories), so I was all pumped up about $200 in shopping. I am not a fast shopper at all, so I spent several hours looking at the items at Solutions. 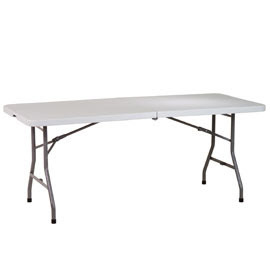 One of the first things that went on my list was a six foot table that folded to 3 foot. Oh yes. That sounded perfect for my outdoor parties. It would take a few weeks longer, and it was $5 extra on shipping. I pressed the button and hoped that it would be as great as I thought it would be. Here's the folding table from the Solutions web site. I do need to snap a photo the next time we are set up in the yard. First off, I would note that it is a very sturdy table and heavy. I can handle it (and it does have a carry handle when it's folded too), but it's not flimsy. That's good, because a table used outdoors gets pretty rough handling sometimes. The table looks more white in the photo, but it's actually a gray color. It does not show dirt like I thought it might. Also it's some type of resin I think, so it wipes off better than the old church tables which seem to be some type of fake wood on top and do stain if you're not careful. The best part, of course, is that that table folds in half. So, it's just three feet wide for storing. I find it fits behind a chair in the game room which is kind of a square type chair. It could go a number of places in my house with it only being 3 feet when folded, but it just really fits perfect behind the chair. I was really excited with the table and the other items I got when I won the contest at Solutions.com. The other things I got were one of the garden hoses that curls so does not get kinked (and we have not kinked it yet), a long handled grill brush (nice quality and bristles do not fall out like some barbecue brushes), and a measuring cup thing where you pour in the pot licker like when you cook down a chicken and then the grease goes up and you can pour out broth that is healthier. The one item that I wanted and why it took so long to decide was the brownie pan. It was made kind of like a maze so that the brownie pieces were all basically edge pieces. Now, you will only understand that if you are a brownie fan who loves the edges and especially the corner pieces. The pan was pretty expensive, and I had the other things on my list too. So, I had to decide what I most wanted. I know my homemade brownies would be super in this pan, but they are great in a regular pan as well. That was my super fun splurge at Solutions.com. I'm sure glad I saw the contest and entered. Everything I got on the prize shopping trip was great and especially the barbecue table which will also be perfect for the Christmas morning brunch I host every year. 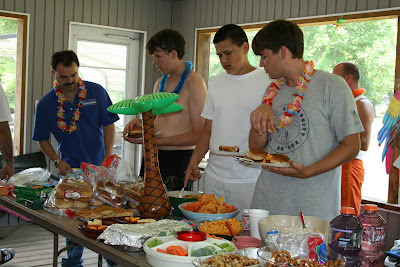 We were getting really crowded on that as well, so a table will be just the thing for that as well as our outdoor fun. It was certainly interesting for me to read that article. Thanx for it. I like such topics and anything connected to this matter. I definitely want to read a bit more soon.